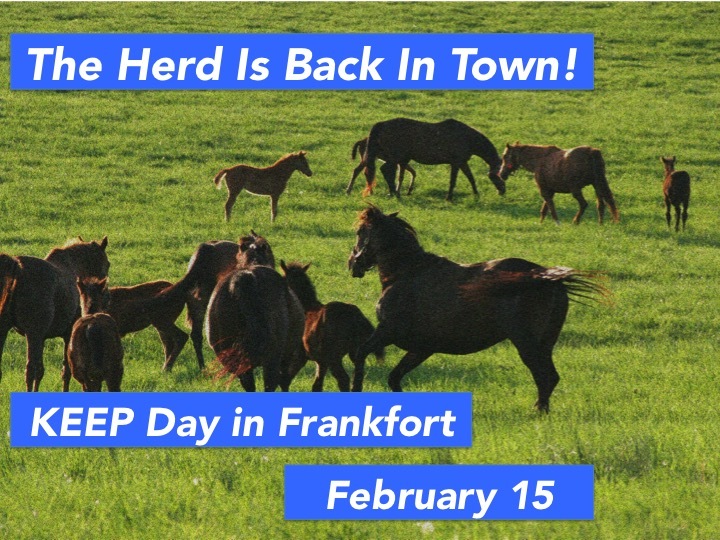 We hope you will join KEEP in Frankfort on February 15, 2018, for KEEP Day. Stay tuned for more information. 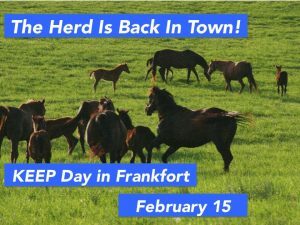 LEXINGTON, Ky. (Wednesday, January 3, 2018) – The Kentucky Equine Education Project (KEEP) has tapped lifelong horse enthusiast and Race for Education co-founder Elisabeth Jensen as its new executive vice president. Joe Clabes, KEEP’s executive director since April 2015, is leaving KEEP to become senior consultant and strategist with the business-management consulting firm Loch Harbour Group and to pursue other business opportunities in the Thoroughbred industry. Under Clabes, KEEP helped pave the way for equines to officially be recognized as livestock in Kentucky – an integral step in the push for sales-tax parity, launched the popular Seattle Slew license plates to raise money for the organization’s charitable foundation and created a multi-breed conference that brought prominent policymakers and officials in to address issues facing those who own or work with horses. Jensen, who started her new position this week, said KEEP’s priorities mesh with her own interests and she embraces the opportunity to tackle those challenges. “That’s my passion – immigration, labor, workforce development and education,” she said. “At Race for Education, our focus is educating young people and attracting them to the industry. That falls into one of the goals of KEEP. I’m really, really excited about it. I think there is a lot of good work we can do. In other changes: Stephen Huffman, a partner in HCM Governmental Relations, is replacing Clabes as KEEP’s chief advocate with the Kentucky State Legislature. KEEP staffer Will Glasscock also is assuming an expanded role in the organization’s legislative efforts. Veteran horsewoman Mary Midkiff, a prominent horsewoman and author with extensive background in multiple disciplines, takes over grassroots development. The Race for Education, which Jensen co-founded in 2002, now will be administered by the KEEP Foundation. The program provides services such as scholarships and financial literacy training to students in the equine industry with financial need. The Race for Education has provided more than $7 million in scholarships and educational programs, earning recognition from the White House Office of Faith-Based and Community Initiatives. Jensen and The Race for Education received the University of Arizona Race Track Industry Program’s Outstanding Contribution to the Racing Industry Award in 2011. Jensen grew up in Indiana, attending New York’s Fashion Institute of Technology and the Wood Tobé-Coburn School, earning a degree in design and merchandising. She worked as an executive for Disney Consumer Products in California, where she rode and showed on the hunter-jumper circuit before moving to Kentucky to pursue a career in the Thoroughbred industry. 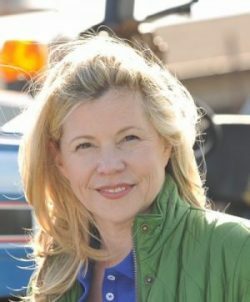 Jensen is married to Kentucky Horse Racing Commission executive director Marc Guilfoil and has a son, Will. They raise cattle on their farm in Lexington. Inspired by Will, Jensen in 2016 founded a basketball camp for young athletes with special needs in 2016 in association with Special Olympics. She served for six years on the State Advisory Panel for Exceptional Children, advising the legislature and governor on policy related to special education. She continues to serve on the Kentucky Department of Education’s Parent Advisory Council. She also serves on the boards of the Groom Elite Program, Old Richmond Road Neighborhood Association and was appointed by Lexington Mayor Jim Gray to the Fayette County Greenspace Commission.